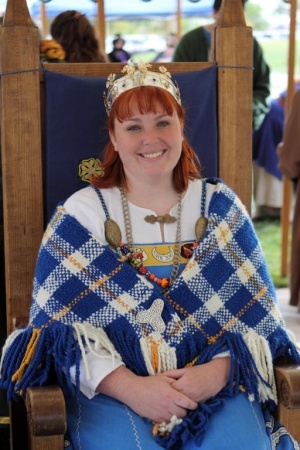 Duchess Kolfinna kottr, KSCA, OP, joined the SCA in 1998. She formerly went under the name of Ciana Masina della Luna. She lived in the Barony of Dun Or in the Kingdom of Caid. 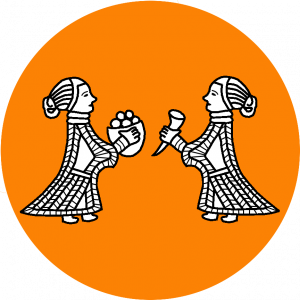 She was the head of Hús Marbæli, and a member of the Early Period Alliance, Hús Beytill, and House Fallen Oaks. Kolfinna was a Knight of Caid who greatly enjoyed tournament fighting. In her spare time she held various offices and tried her best to learn all things Viking. She fought for and was fought for by her love, Duke Sven Örfhendur. In Crown Tournament, she fought for the honor of Baron Laertes McBride. She was elevated to the Order of the Chivalry on 2/19/2005 by Direk IV and Chamayn, King and Queen of Caid. She was elevated to Countess on 11/11/2006 by Edric IV and Faizah, King and Queen of Caid. She was elevated to Duchess on 6/6/2009 by Edward II and Mora II, King and Queen of Caid. And she was elevated to the Order of the Pelican on 9/6/2009 by Edward II and Mora II, King and Queen of Caid. Kolfinna was born in 820 c.e. in the Viking Age trading port of Hedeby, Denmark. She is known as a Shield Maiden because she has participated on several raids and works as a guardsman on trading ships owned and operated by her parents Saxi and Sigrid. Duchess Kolfinna died October 1, 2009 from complications from H1N1 viral infection. Sven has asked that I post that Kolfinna Kottr, has been taken by the Valkyries today at 4:55. She died as a true warrior with friends at her side and a weapon in hand. Thank you ALL for your continuous support through this extremely trying time. Thus ends the final court of Kolfinna Kottr. A memorial for Kolfinna kottr was held on Saturday, Oct 10, 2009, on the Main Battlefield of Great Western War 2009 at 2 PM. Inducted by Sean of the Chipendales into The Chipendales, a fighting group of like-minded individuals, mostly residing in the Kingdom of Calontir, 2009. Web Sites not under official SCA control. Please feel free to leave your memories of Kolfinna. The following banner was created by Tiarna Cithrúadh dubán, Barony of Lyondemere and was proudly displayed on the Kingdom Website for the Month of October. I will think of our Warrior Duchess. I will think how She died as a warrior should; fighting till Her last breath. I will think Her an inspiration for facing the Legion beast that threatens us all. I will think She has earned Her place in Valhalla. And I shall not mourn. I will remember that this beast still stalks our lands. I will remember to be wary of it, and to make what defenses I can against its predations. And should it come for me, I shall fight it in my turn, and "for Kolfinna" will be my warcry. And I will think of our Warrior Duchess. Was Hael! To her life and deeds! If ever there was a time I could have wished that call to fall upon deaf ears, this is the time. Make no mistake, Tears are for the strong. deserves to be mourned, to be missed, to know our deepest love and respect. We have shared good times, played together, served together and lived our own lives as well. I cried with joy at her knighting. I cry in anger, in love, in sorrow and in grief tonight. Tomorrow is soon enough to begin anew, tonight let there be no dry pillow in the known world. Let our love fall down each cheek. Let our cries of sorrow be heard from every corner, that the Heavens cannot help to hear our sorrow. for we have lost a shining light in our midst. The Summerlands gain is most surely our very dear loss. I just read a post saying that Kitty passed. I have no words to express the grief that you poor people have been going through this year. Please send my love and what ever power I can to Sven. I know how much they both mean to Sigvald. I am so sorry. She is not alone in the great halls of Valhalla, Sig will be there to greet her. I know that is small assurance in this time but it may help in time. Know that my heart is with you all in this time of grief and most of all with Sven. Yesterday our dear Duchess kofinna kottr, known in the modern world as Kitty Sexton, left this world for the next. She was only 29 from all reports. Trying to put things in words is hard so I've been thinking about my memories of her. We weren't BFFs or anything like that but I met her about 13 years ago when I first started fencing in the SCA. She was this energetic kid who had taken up fencing because she was only ~16 and wasn't old enough to fight with the rattan sticks. She was up in Darach (Ventura area) and I was down in Gyldenholt (Orange County) so I didn't see her that much, but she was always fun to fight with on the field. Later on I got to see her really blossom as an armored combat fighter. I had the wonderful opportunity to work with her as Earl Marshal when I was Kingdom Rapier Marshal and she taught me a lot about dealing with the difficult parts of the job with patience, grace, and just a little bit of sarcasm. I was fortunate to get to know her a lot better then, and started to get to know the man in her life, Sven, who was always just one of those armored fighters that I didn't know that well. I'm very grateful for that. In thinking about her life, I can really say she LIVED it. She worked hard, played hard, fought hard, partied hard. She really loved life and all of us in it. For all that she was more than 10 years younger than I, I think she lived just a little more life that I have. I don't know if she ever thought she might not be around forever, but she certainly lived like she just had this one life and it was going to count. I think it did. So while we all need to take the time to grieve, I don't think she'd want us to grieve for too long. I think she'd want us to go LIVE our lives to the fullest. So at GWW I will endeavor not to greive but to celebrate her life and play hard, fight hard, and party hard in her honor. But I know it will be so very hard. Will you help? For Kolfinna. May your memory live long and may your next life be just as wonderful but far longer than this one. Valhalla's Valkeries swell once more with the arrival of a strong, couragous warrior. An artist, a calm, calculating learned warrior. A woman whos knight swelled with pride; "Thats MY Squire" Malachis words fill my head. A warrior who hit hard, learned all, and was giving of time, talent, skill and strength. A Duchess, a flower off the field, a Knight on the field, and a powerhouse everywhere. Valhalla, be proud, but you just borrow her until the Gods come back again; and we get our loved Kitty back!!! The sound of hoofbeats as the Valkyries ride. To Midgard's autumn they fly. They ride towards their goal. By a common threat laid low. To the fallen knights side they come. Her life's journey sadly done. By mortal eyes unseen, the knight does stand. Towards Valhalla's gates she rides. A merry and wise Duchess lost to us how? Sir Kolfinna rides, a Valkyrie now. I wrote this in memory of Kolfinna. Though I hardly knew her, she was, and is, an inspiration to me both as a female fighter and as a person. Most of us knew her as Sir Kolfinna kottr. She was the first, and to date only, female knight made in our kingdom, in recognition of her skill at playing the primary sport of the SCA. She fought with skill, yes, as well as an infectious enthusiasm. Whatever she did, she did with her whole heart and soul, throwing herself at life and activities. She was admitted to the Order of the Pelican as she was falling ill with what at first seemed just a cold. She always had a smile on her face. Smile? Hah! Usually a broad grin. But even when no one was looking, resting from helping to cook a meal for a hundred friends at Winter Weekend, back to the fire and staring down at nothing on the floor, a smile still quirked her mouth. She talked with Ian, Jamal's son, at Winter Weekend using her first language and his preferred language - sign language. Behind the scenes on the wiki, she was asking, answering, quietly fixing things that needed attention. She and Sven presided over the Court at Lyondemere in 2006, when we stepped down as Baron and Baroness. I sat next to her in the finals of Crown in Spring of this year, when Jamal fought Edward the Sinister for the honor of succeeding her and Sven as monarchs. Sir Edward claimed that honor. I used her website and her directions to create my first Viking apron dress. I admired the embroidery she did for others. That's how I knew her. Jamal told me of when he first met her in 1998 or so. He was at a tourney in Darach or Isles. Three girls came over from the nearby soccer field to watch. Kitty led the others to the tournament field. She cheered for him, and was shushed, because one doesn't cheer at tournaments here. She was not in the SCA. Afterwards, she offered Jamal a sip of her Dr. Pepper because he looked hot and tired. After that, he was her "Dr. Pepper Brother" and she was his "Dr. Pepper Sister." He may have been the first person to talk to her about SCA fighting. Clearly he was not the last. And I looked, as I rested my feet from the weary path I had chosen. I spotted a sparrow, taking wing on the gentle breeze the Morning provided. As I watched the delicate flight on that gossamer sea, I pondered and thought of thee. I knew ye not, dear Lady, and yet we met in spirit. For we have those in common knowledge, and our spirits commingled with like minds. I knew ye not, dear Lady, and yet we seem to meet, with those to whom we speak. For thou livest in the hearts of they that knew ye, and adored ye. It is often that those things that are most fragile are also the most worthwhile. Whether it is a fleeting moment of bliss, or a kind act to a child, or even a leaf falling from the Oak- with but one word or movement, it can be shattered beyond recognition. And thus, we learn to treasure that which is most frail- the gift of Life. The flight of Life is much like that of a sparrow- delicate to witness, and a marvel to behold. We watch casually when we see it, and treasure it far after it's gone. Sometimes, we ask for nothing more than to glimpse it dancing in the wind. And when we catch it, we are beholding a miracle. Although my day is saddened to miss the sparrow's flight, I do not grieve. For I know that thou hast flown to a better place- a place where I hope my path takes me. Although my spirit cries, I know that we will perchance meet in greener meadows, and laugh as young children. When all things are accounted for, and all is said and done, I know that the path I tread shall cross with the flight of this sparrow, one day. In shires and barons' lands a grievous wail. All noble hearts break at Kolfinna's fall. Three weeks ago she was so strong and hale. Kolfinna will forever remain one of my dearest, truest SCA friends. That's not to say we hung out every event or shared a household or anything. We didn't. But she always went out of her way to make me feel loved and befriended, as I suspect she did for so many... a magical talent she had and shared with anyone willing to open their hearts to her. Everyone that was lucky enough to have Kitty cross their path like a black cat on Friday the 13th are the luckiest people in the world. Truly blessed. I am a better person for having known her. Some of the ways I conduct myself I picked up by emulating her style, her vivacity and her "devil may care" attitude. She was a "don't sweat the small stuff" girl. She was a "laugh at the lame stuff" girl. She was a "love hard, play hard" girl. If I live all my life with half of her "je ne sais quoi", I will consider it a complete success. If nothing else, Kitty's death will teach me to "come clean". To tell the people I love how I feel. Sooner rather than later. "The candles will burn out long before, her legend ever will." 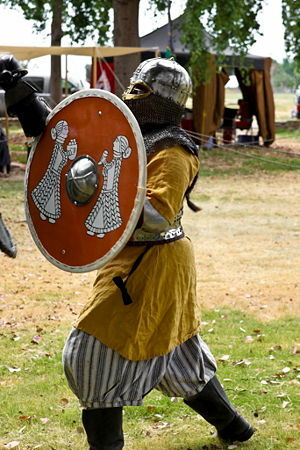 This weekend last, at our annual Spring war in the Barony of Mordenvale, was held a memorial tourney for her Grace. His Majesty Gabriel, Sir Agro Agwesi and his majesty's Guard held the field in a Pas d'Armes in her memory. Her Majesty, and the ladies of the Rose present, strewed rose petals across the field in tribute and spoke of the loss of a valiant lady and Knight. More than twenty fighters contested the field in a variety of weapons forms, both open field, over the barrier and melee. In a particularly poignant display, those ladies who took the field banded together in melee and defeated the tenans, a stirring tribute. Vale your Grace, sleep well. To the beautiful Kingdom of Caid, greetings from Viscountess Syele von der Rosen of the West Kingdom! Many of you asked me for the lyrics to the song I performed for our dear friend Duchess Kolfinna this past weekend, and I thought this was the best way to provide them. Sir Kolfinna was a bright light - it was my greatest honor to be counted amongst her friends, and this small tribute was the least I could do to repay her. I thank you all for allowing me to be a small part of her tribute, and for offering such great hospitality and friendship to me and mine throughout the weekend - truly, Caid, you shine through your sorrow at the loss of this great Lady. Long Live the Kingdom of Caid, and long live Kolfinna in our hearts and memories. From tears to laughter a rainbow of emotion stretched from horizon to horizon. Over the weekend hung an emotional rain cloud of a memorial. The memorial was for an exceptional person that has had a profound effect on many lives. By my observations she touched far more lives than she actually met, including my own. I didn't really know Kitty but after this weekend I feel I certainly know who she is now. I use the present tense because the effect of her life is still here with the living. Those close to her with the strength to speak at the memorial painted a picture of a life that touched and inspired. Her life was short but the overwhelming positive effect it had on many became the focal point as her loved ones shared their grief. That rain cloud burst in the form of tears flowing from the eyes of those touched by this remarkable young life tragically taken too soon. The rainbow that followed had only one color, a color that dominated the landscape. Orange ribbons adorned arms and covered hearts in ribbons of remembrance. The sky burned orange as the sun took leave of the day. Bifrost was paved in orange bathed in burning light as bright as the life that called for its appearance. The bridge to Valhalla held up by the spirits raised in celebration. Celebration of this beautiful life lasted the whole night. Tears dried and turned to smiles and stories of inspiration as her life took leave and her legacy took root. Kolfinna was welcoming. As Crescent, I accompanied Queen Kolfinna on her progress. On the way out to the archery field, I got delayed with a bit of business. I fully expected to have to run to catch up, but when I turned around, I found the entire court resting in the shade of a tree. I said that I was surprised to find them still there, and Kolfinna replied, "Oh, we wouldn't leave without you," making me feel as though she wanted me to be around, rather than expected me to be around. Kolfinna was mischievous. Before closing court, while Kolfinna was Lady Caid for the second time, she had in her possession a miniature lawn gnome which resembled King Edward. It also had a chip in it which would record and play back sound. Kolfinna was in the middle of recording her voice when the King turned toward her. She froze for a moment like a little girl caught being naughty - wide eyed and with the gnome pressed to her lips like a stolen cookie. Then she pressed "play" and tossed it at the King. Flying through the air, the gnome called out, "Die, Daddy! Die!" Kolfinna fought hard. Long ago, I participated in armored combat and practiced with her a couple times. She had a low wrap shot that landed just below my bottom, and she could hit me there again and again. Later I would complain to my wife about the "spanking" she had given me. Kolfinna worked tirelessly. She is largely responsible for creating this site, and it is a credit to the Kingdom. She has many "legacies", and Compendium Caidis is one which will, hopefully, last a long, long time. She took the maintenance of the "In Memoriam" category very seriously, wishing those who have passed to be remembered--forever a part of our story. On the evening of October 1, James the Inconstant shouldered the sad duty of adding Her Grace to that category. I am pleased to see this page blossom with beautiful words from her loved ones, as it should be. We will do our best to maintain her page with the same care that she would have tendered. There are many people who knew Kottr much better than I did. I never even met her in person, but knew her throught this site which is why I think of her by her user name Kottr. When I first started editing here about a year ago, she almost immediately created the beginning of a member page for me. Then she made a link to an SCA song I'd worked on, and added a category to an article I started, and answered my questions and emailed me, etc. I thought, "I don't even live in Caid anymore, haven't been active in the SCA for quite a while, am completely new here, and the woman who's Queen of Caid is going out of her way to help me?" I've edited wikis for 10 years, since H2G2 began, so I know how rare that kind of help is. I met Duchess Kolfinna at a Lillies, where I heralded for Duke Sven during their reign (the first one, I believe). The strength of her character, the warmth that she showed to everything she saw in the society, and the simple way she lived the chivalric virtues made an impression on me even in a short time. When I heard she had passed, I was stunned, and wrote this in her honor. and the love of her people. Marked her much as tripled leaves. Lost in its' indifferent spin. The hands of time undo. Except for one eternal gift. Cannot be snuffed by such uncaring tides. The minds of her friends in their remembrances. The hearts of her people, forever more. Kolfinna at her Queen's Champion Equestrian. This page was last modified on 23 November 2015, at 15:07.